Decleor are known for their luxury, professional and amazing product line offering so many products for all skin types and ages. 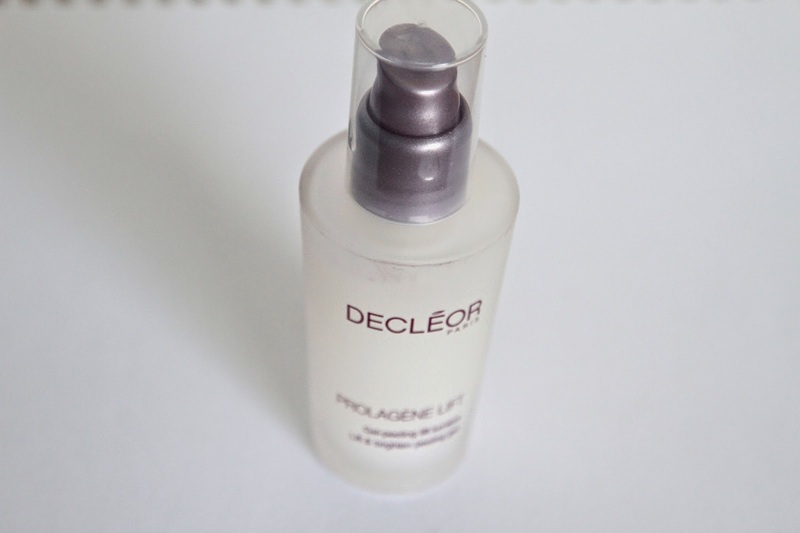 Today I’m going to be talking about the Prolagene Lift – Lift and Brightening Gel. Id never used a product like this before and after reading up on it before I tried it out, it looked amazing. Now I’m all about exfoliating and refreshing the skin, and this just does all of that in one. This product is designed to enhance mature skin giving it that boost that it may need, but you know me, I believe a product should never be restricted to mature skin. The gel comes in a gorgeous glass pump tube, with a nice small tip to easily get the right amount of solution onto your finger tips. First of all make sure you have washed and cleansed your skin so your working on a clean base, then massage the gel around your face and neck, and leave for 5 minutes. Once 5 minutes is up, rinse off and carry on with your skincare routine. I found when using this, and it does say on the back of the box, that a tingling sensation can occur but its just showing that its working. Its recommended that you use an SPF moisturiser or sun cream the day after you use this product as it contains Alpha Hydroxy-Acids, making your skin more sensitive to sun. It also contains L-Proline to stimulate collagen, Hyaluronic Acid for hydration and natural oils including Aloe Vera and Rose Water to smooth and soothe skin. So what do I think? To me this product is great for them spa Sundays as I like to call them, where you take a little extra time to do your skincare routine, maybe a face mask, bubble bath… you know what I’m getting at. So this would be a perfect product to introduce into this. Id use this twice a week, once on a weekend and maybe Wednesday/Thursday. I found it really did boost the glow in my skin and most of all made it feel super soft. I found it easier to apply onto a cotton pad and then it gave an even coverage over my face on application. I loved trying out this product and as mentioned before I can see this fitting well into my weekly routine. Its a little pricy at £46.50, but totally worth the treat! Previous Post Skincare | Secret Skincare Weapon!